Our buyers are just about to leave on our annual buying trip to the Dallas market, so we are on the brink of having ALL sorts of new things in stock! But we never actually stop getting new products in ~ our guys hang new things every day in all 3 showrooms. So today I thought I'd show you a few of the things they've hung lately here in Chantilly. 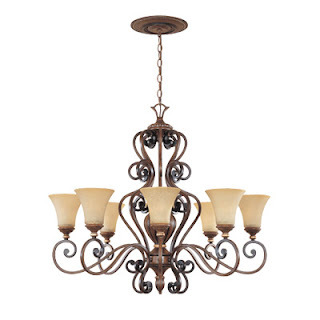 This is an oval chandelier by Designers Fountain. The finish is really rich. 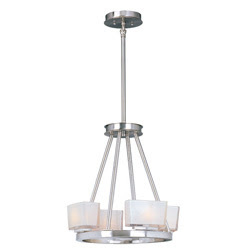 This is a really cute, small contemporary chandelier from Maxim. We got this World Imports lantern in 2 sizes. This one is 16" x 29" with one tier of candles inside. This is the big daddy, at 32" x 59" and has 2 tiers inside. 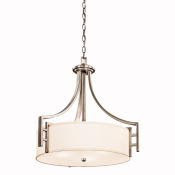 And this is our newest drum shade pendant from Kichler. 1) Next week we're having our Cooper seminars where you can earn continuing education credits. You can RSVP to me (cschla@dominionelectric.com) or Greg Tiedemann in Arlington (Gtiede@dominionelectric.com). Arlington's is on Tue. 1/19, Chantilly's is Wed. 1/20, and Laurel's is Thu. 1/21. 2) Become a Facebook fan of Dominion Electric Supply, and you'll be entered to win a $100 gift certificate!